We are pleased to bring you an interview with the incredible Cylin Busby, recorded at Vroman's Bookstore in Pasadena. 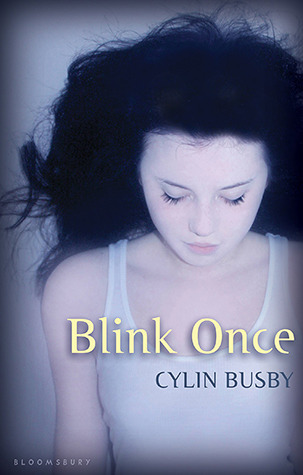 We had so much fun chatting with Cylin about her latest book for teens, Blink Once, a suspenseful paranormal thriller- what kind of research she did, and what it was like to write from a male perspective. We also talked about the intense memoir she co-wrote with her father, The Year We Disappeared, and then we capped it all off with some truly epic regional accents. We have a giveaway to go along with this episode of the podcast! To win an autographed hardcover cover of Blink Once, comment on this post and tell us which one of Cylin's accents you liked best. Be sure to include your email address or Twitter username so we can contact you if you're the winner. Deadline is Tuesday, May 14, 11:59 pm PST. Contest open to US residents only. Visit cylinbusby.com to keep up with Cylin, and be sure to check out her publisher, Bloomsbury. Many thanks go to Cylin's rockstar publicist, Deb Shapiro, for setting up this interview!